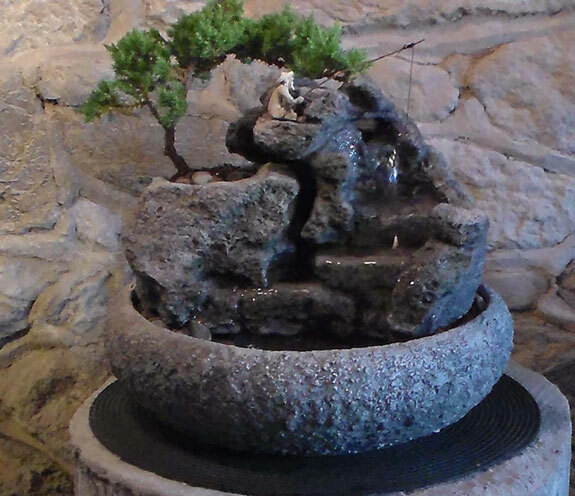 A small bonsai tree grows from the top of this small indoor water fountain . If you like, we can substitute a self watering creeping fig house plant instead. The multi layering of the rock gives an unusual light and flickering flowing effect of the water. Very soothing to behold. We use submersible pumps that are quiet. The sounds emitting from the cascading waterfalls are soothing, because of the special techniques we use. All of our indoor water fountains are guaranteed NOT to splash! You can view this indoor water fountain on YouTube by clicking this link https://www.youtube.com/watch?v=madWOxgahbw. We have other fountains as well. Just click onto the navigation to the left.